We all know that when traveling, less is usually more, especially when traveling with kids. The less you have to haul around the better it is for everyone. This is exactly why we’ve put together our top five favorite items to bring along when you’re traveling with kids. As parents we never have enough hands to carry everything kids usually require while traveling. It’s always a must that when we travel, my kids have their own backpacks filled with fun stickers, activity books, and light snacks. This well help your little one be prepared for their big adventure. It’s time they started carrying their own graham crackers! Depending on the ages of your kids, an umbrella stroller is the way to go when traveling. It’s lightweight and easy to carry. Just strap your tot in and you are ready to go. Perfect for rushing to your gate at the airport or easily boarding your ship. A kit full of medical necessities is a must when traveling with kids. Have you ever noticed the prices of Band-Aids or aloe while traveling? It’s not pretty. Make sure you’re prepared for the unexpected and pack your first aid kit full of bandages; antibacterial ointment; and allergy, pain, and motion sickness meds. A fully stocked kit is always best. Pictures last a lifetime. Having the ability to take pictures of your kids playing in and under the water is absolutely priceless, as these will be memories they will cherish forever. If you don’t want to invest in a waterproof camera, you can also find disposable waterproof cameras or a waterproof case for your smartphone. I know, I know. Usually a vacation means escaping the everyday hustle and bustle, but think about the travel time getting to your destination. 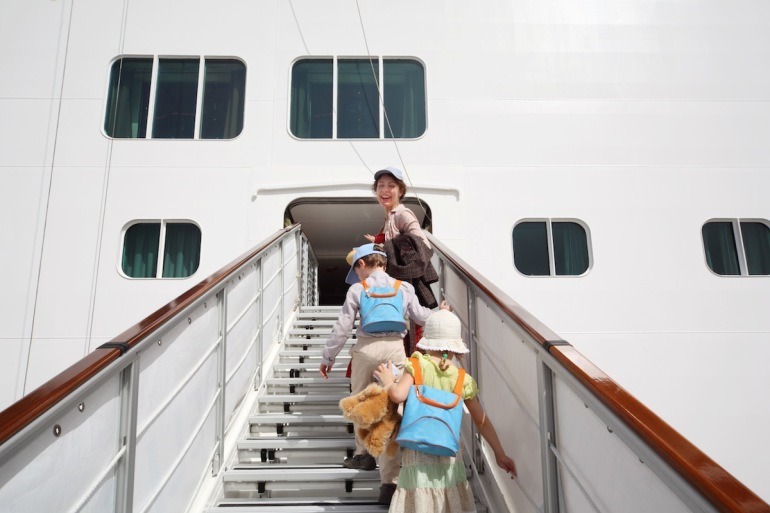 Before you set sail on your cruise, there will most likely be some flying or driving time. Keeping your little one still during a long trip can be agonizing if you aren’t prepared. Give them a set of headphones and some fun (and educational, of course) game apps, and it’ll make the transition a lot smoother. What are some of your favorite go-to items when traveling with kids? Comment below and let us know! Gear Up, Wind Down… Add on a few pre- and post-cruise nights for that much-needed vacation buffer. Most definitely activity bags! Depends on how long the trip is, you may need 5 at the least for them to cycle through. we always travel with reusable bottles of water and some healthy snacks. i bring important things of my kids such as their bottle with milk, wet wipes , vitamins and first aide kit, you never know what will happen. I hear this even for short car rides! Tablets are a must. I have 5 kids, the 4 older kids all have tablets, they are a must!